(Photo by John Valenzuela) Slug, of Atmosphere, started off his set with “God Loves Ugly” which caused some of the women next to me to loudly rhyme along word for word, overshadowing the men. Just before Slug and producer/DJ Ant got on stage, a lot of people sitting around the fountain at the National Orange Show got up and rushed to see their performance. What I really liked about Slug’s performance, outside of the picture perfect vocals and crowd-friendly material, is how he honestly seemed to be enjoying himself performing with Brother Ali and Murs. 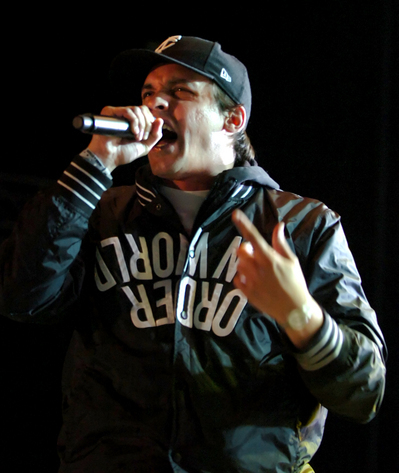 This entry was posted in Uncategorized and tagged Slug of Atmosphere at Paid Dues Festival 2009 by Wes Woods. Bookmark the permalink.